Just a few days left until February, so it’s almost time for the first St Agnes Community Market of 2018! It’s a lovely local market held on the first Saturday of each month (apart from January) at the Miners and Mechanics Institute in St Agnes. We’ll be there with a good selection of Perran Yarns, kits, ribbon packs and buttons. There’s also a variety of other local small businesses and craftspeople offering beautiful silver jewellery, handmade dolls, glassware, children’s clothing, cushions, cards, knitwear, and food. I thoroughly recommend treating yourself to a delicious lunch at the Cuckoo Cafe in the same building whilst you’re there. 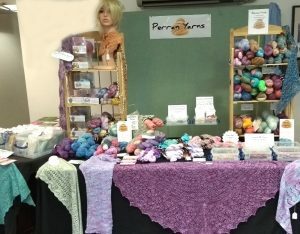 If you do come along and purchase something from Perran Yarns, mention this blog post for a special discount! ← New for 2018 – Flamingo chiffon!